Recorded and mixed at Echo Music and Recording, Ltd. St. John's, NF. 1989 - Sept. 1990, by Jim Payne, Wallace Hammond and Tom Ronan. Cover by Marilyn Koop. Recorded and mixed at Echo Music and Recording, Ltd. St. John's, NF. 1989 - Sept. 1990, by Jim Payne, Wallace Hammond and Tom Ronan. All tunes traditional except Stan Rogers (Guinchard), The Wreck of the Steamship "Ethie" (Guinchard, Samson, Eisan), My Loving Little Sailor Boy (Trad./Guinchard), and Prosper's Jig (Trad./Guinchard). 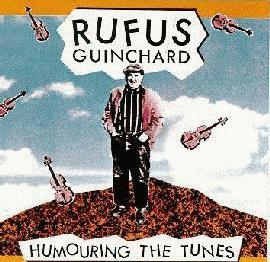 Rufus Guinchard died on September 7th, 1990, one day after his 91st birthday. He had played the fiddle since the age of eleven and possessed an extensive and unique repertoire of tunes, many learned from fiddlers who were old men when he was a boy, and whose names they now bear. For decades Rufus was the fiddler of choice in communities along the Great Northern Peninsula of Newfoundland, often walking many miles to play for square sets, cotillions, and reels that were the main source of community entertainment. It was for these dances that he first started to "humour the tunes, adding more notes 'cause it makes 'em go better for dancing, see". In the last twenty years, Rufus travelled the world, his quiet dignity and infectious tunes endearing him to tens of thousands of people. Yet Rufus was more than a fiddler. His stories about life in Newfoundland throughout this century were a wealth of history, sociology, culture and politics. He had a repertoire of tunes that he played only on the accordion, but never in public. Two of those are included on this recording. He also loved traditional songs. He composed The Wreck of the Steamship "Ethie" in January of 1920, with Maud Samson and Sabrina Eisan of Sally's Cove, a month after the ship was wrecked on Martin's Point, in what is now Gros Morne National Park. Rufus finished work on the "Ethie" five days before the mishap. He remembered two verses and the chorus of My Loving Little Sailor Boy from one of his school teachers who used to sing it when he was a boy. He composed the rest to make a complete song. This recording was done a little at a time over the past year, a couple of tunes on each of his occasional visits to St.John's. He didn't get to see it through, but it does represent what he was up to until just before he died. He maintained his high spirits and his irrepressible gift of laughter until the end. Rufus lived life to the fullest and left us some great music to play when he could no longer be here to play with us. May we all leave such a positive legacy. Enjoy!